Add-in-board partner Inno3D has shared a chart which appears to drop a heavy hint on what level of performance to expect from graphics cards based upon the as-yet to be announced Nvidia GeForce GTX 1060. Without much deduction or reading between the lines required, it looks pretty clear that the upcoming GTX 1060 will offer performance somewhere between the currently available GTX 970 and GTX 980. It is expected that the third Pascal graphics card to be launched by Nvidia will be the GeForce GTX 1060. Previous information gathered from shipping manifests and suchlike point to a graphics card based upon a GP106 GPU. The rather spartan threads of information and current best-guesses point to the card utilising either 4GB or 8GB of GDDR5 memory connected to a 256-bit memory bus. 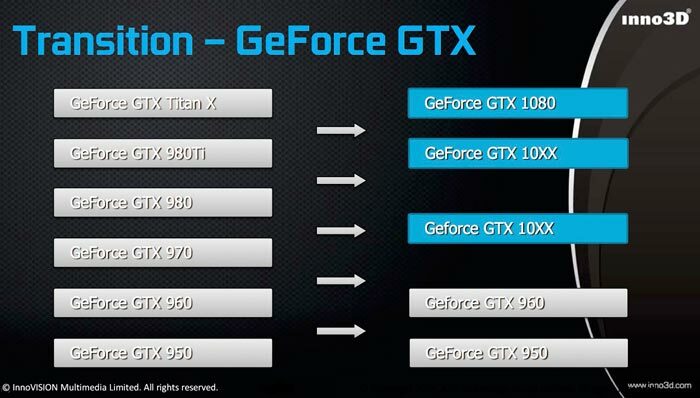 If the above performance target pans out the new GTX 1060 will be a welcome upgrade to those who look at this sector of the market for their graphics upgrades. However, the message we seem to be getting from Nvidia is that the GTX 1000 Series are pricier than the previous generations at launch. It's difficult to know if such a price hike could be sustained past some 'Founders Edition' period in this more competitive part of the market. Remember this is probably the area where AMD will compete most strongly with its first 14nm Polaris GPUs. 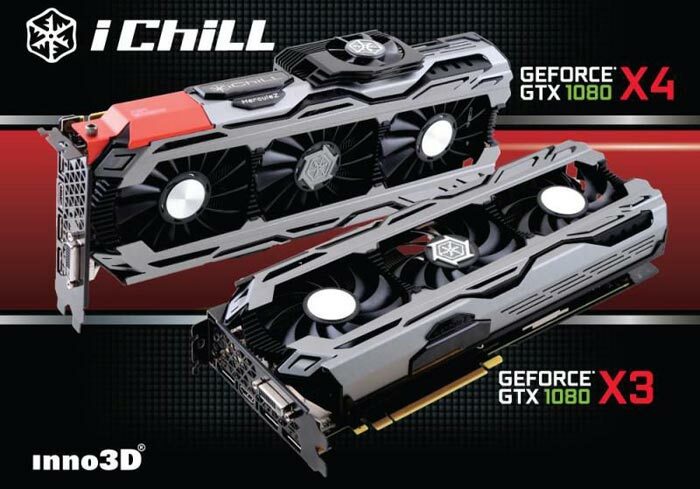 Pictures of the recently launched Inno3D GeForce GTX 1080 iChill edition x4 and x3 graphics cards. Depends on too many unknown variables. Is there a 2560 shader Polaris 10 SKU? What will Polaris 10 clock to? What is Polaris 10's next generation turbo boost capable of? What improvements does GCN4 bring? Polaris 10 should have a SKU that is in the same ballpark as the 1070, and I don't see it dropping as low as a 1280 shader 1060 (at 1600MHz). Instant price war if so, not the best way for AMD to try and increase margins, especially if nVidia have a ~200mm2 die size for the 1060. Considering that AMD is currently using 365MM2 and 438MM2 chips,a lower TDP 232MM2 chip should be cheaper to make especially considering the cost of the PCB and cooling required. The R9 390 and R9 390X also use 512 bit memory controllers too. Even with a 200MM2 GP106,AMD is still in a much better situation with margins - the GM206 is around the same size as the rumoured GP106 in die area. Taking the other rumours into account it appears more likely the GTX1060TI(which is being hinted at in this leak) is using the 314mm2 GP104 chip as three GP104 variants have been leaked. The first two are obviously the GTX1080 and GTX1070. That means Nvidia is using a 35% larger chip too. Taking the other rumours into account it appears the GTX1060TI(which is being hinted at in this leak) is using the 314mm2 GP104 chip as three GP104 variants have been leaked. That means Nvidia is using a 35% larger chip too. Hexus are only saying 1060 so that was all I was referring to. A 1060ti on waste GP104 dies could also be possible, they'd have to be pretty poor dies given the 1070 already makes do with a huge cut back, though I guess they may feel they need to cover off Polaris until the <200mm2 GP106 comes online.